I've wanted to corn my own beef (hubba) for a few years, but it never seemed to work out. A couple years ago, I couldn't find pink salt anywhere local and didn't have time to order it online. Last year, I had curing salt on-hand but didn't plan enough time to brine the brisket before St. Patrick's Day. This year, however, I planned ahead…I made the brine last Monday. I added the brisket on Tuesday, and I let that sucker sit for 5 days before our big Sunday dinner. First, I worried that the meat wouldn't look right because I used curing salt instead of pink salt. I found conflicting opinions online about this…some people say the pink salt is what gives corned beef its red tint, while others maintain that it's the brining process that makes it red (and that the salt is pink so as not to confuse it with regular table salt). Curing salts are generally a mix of table salt, sodium nitrite and sometimes sodium nitrate, curing agents that also contribute to the development of color and flavor. Common types of curing salts are Prague powder #1 (94% salt and 6% sodium nitrite) and Prague powder #2 (which also includes sodium nitrate). I used Morton's Tender Quick (which contains salt, sodium nitrate, and sodium nitrite). Secondly, I was worried about the texture. I thought it might not be as tender as corned beef should be. Brisket can be so tough. I normally cook corned beef in the crockpot all day, but decided to follow the recipe fully and braise the brined brisket on the stovetop for 3 hours. Finally, I was worried that the homemade version wouldn't taste like the corned beef I knew. Like most people, I only cook corned beef once a year…and I buy one from the grocery store. I know they are not organic, locally-raised, pasture-fed, etc…but sometimes a once-a-year tradition supersedes all that. I figure, at least I wasn't using corned beef from a can like my mom used to. But, I shouldn't have worried. The finished brisket looked good! While it wasn't red all the way through, there was a reddish tint around the edges. It was perfectly tender, and it tasted great! BETTER than the corned beefs past. * I used Morton Tender Quick curing salt instead of pink salt. Make the brine: Combine the water, salt, sugar, pink salt, garlic, and 2 tablespoons of the pickling spices in a pot large enough to hold the brisket comfortably. Bring to a simmer, stirring until the salt and sugar are dissolved. Remove the pot from the heat and allow to cool to room temperature, then refrigerate the brine until it’s completely chilled. Place the brisket in the brine and weight it down with a plate to keep it submerged. Refrigerate for 5 days. 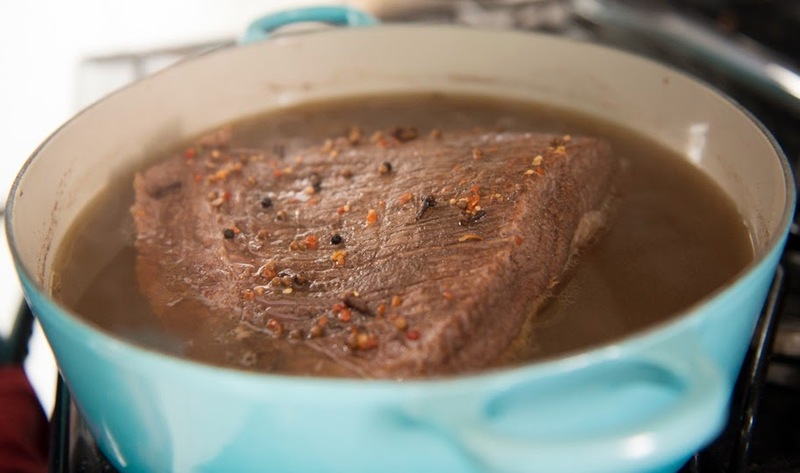 Remove the brisket from the brine and rinse it thoroughly under cool running water. 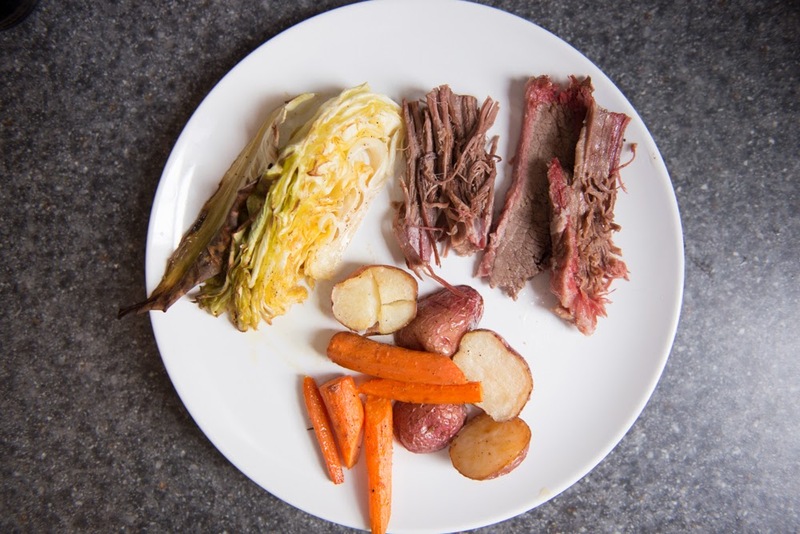 Cook the corned beef: Place the brisket in a pot just large enough to hold it and add enough water to cover the meat. Add the remaining 2 tablespoons of pickling spice and bring to a boil, then reduce the heat, cover, and simmer gently for about 3 hours, or until the brisket is fork-tender. There should always be enough water to cover the brisket; replenish the water if it gets too low. Remove the corned beef from the cooking liquid. Slice the meat and serve warm, or cool, then wrap and refrigerate until you’re ready to serve, or for up to a week.